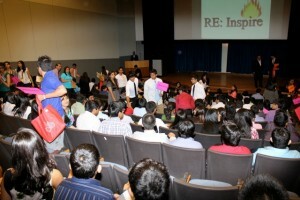 Home » Ideas » What If Every School Had a Conference Led by Students? How can motivated students influence their peers? How can educators and parents make learning at school more meaningful? How can students be challenged to do more than get good grades? Organizing a conference at a school with student input and initiative can be a solution. There have been countless tedx events at schools across the world. One of the fascinating models for Tedx events, is TedxEmory in Atlanta. Its speakers are selected solely from the student body with a student judge committee and auditions. There was also a recent conference that I attended called the Global Issues Summit at the Global Academy at Clements High School in Sugar Land, Texas. The conference was organized jointly with a big student body and directly addressed the Millenium Development Goals. It also brought in organizations that students could engage with and BuildMyIdea was represented there. Wouldn’t it be amazing if every school to have a conference that enabled students to put together ideas, issues and concerns they cared about? Imagine, it would be students leading students and drawing from the best resources available. Educators could play the role of mentoring, coaching and enabling sustainability with iterative improvements. Check out tedx now to see how you can develop a conference of your own.